I don't know when my obsession with BBQ chicken began. I remember in college my roommate Heather loved BBQ sauce and I can distinctly remember not getting her love for it. I mean, I thought it was good, but I wasn't one of those people who was dying over it. Then at some point in my pregnancy with Landon I started craving it. I think it began with Houlihan's BBQ chicken flatbread. That appetizer is what I'd usually get for my meal when we'd go there (and we'd go often because John loves Houlihan's). Now I'm a freak with my love BBQ chicken, particularly pizza. When this recipe for pinwheels popped up on Pinterest I pinned it and instantly bought the ingredients. Hello- all my favorite things in the world in one!! BBQ chicken, pizza, and fun shaped rolls for dinner. Can we all agree there's nothing better?! So I made these, served it with a salad, and dinner was done in no time. I can't wait to make these again! 1- Preheat the oven to 425. 2- Dice the chicken into small pieces. Heat the oil over medium-high heat in the skillet. 3- Add the chicken and stir until golden. Toss in just enough BBQ sauce to coat the chicken (about 2 tbsp). 4- Meanwhile, roll out the dough. 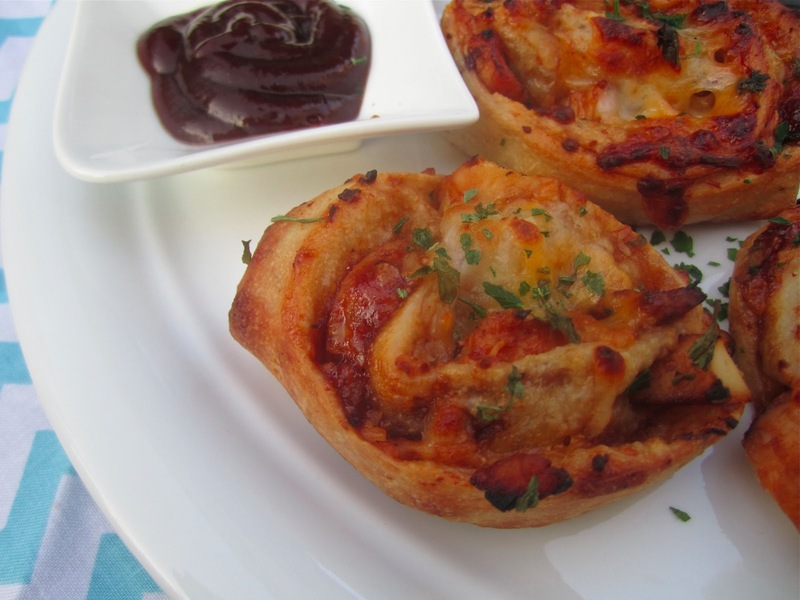 Spread an even layer of BBQ sauce over the dough. Top with chicken, cheese, and cilantro. 5- Starting on the long end roll the dough inward and continue rolling until you have a long snake-shaped roll. 6- Using a cerated knife, slice the rolls. Place on a cookie sheet covered with a silpat or parchment paper. 7- Bake for 20 minutes or so- until the dough is golden and the cheese is melted. Serve with additional BBQ sauce if desired. OMG - YUM!!!!!! I need to make these. STAT. LOL! Thanks so much for the heads up!!! Doh!